I've been running for more than a decade. Anyone who knows me knows that it's one of my favourite things to do. Running is my release. It's my meditation, and it always brightens my day. But it was still a surprise to many people when I continued running during my pregnancy. I was surprised at the strong reaction of those around me when, continuing as I had pre-pregnancy and running intervals and hills, I enrolled in several races. 'You're not still running are you?' or 'Won't you harm the baby if you run?' were just some of the questions I've had to respond to during the past six months. I knew I wanted to have an active pregnancy and maintain my healthy lifestyle, which included running. Thankfully my doctor was supportive. So at six weeks I ran a PB for a half marathon, at 12 weeks I backed it up with a 25km coastal run, skimming five minutes off the previous year's finish time. 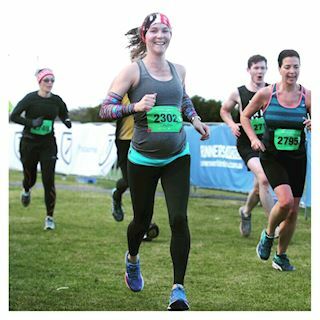 At 23 weeks I ran 14kms in one of the world's biggest fun runs - the City2Surf, and just last week, at 27 weeks pregnant, I completed a 10km run in blizzard conditions - all the while with a huge smile on my face. Despite these achievements, people still tend to pathologize pregnancy. There are still a lot of people with the view that pregnancy is a time to put your feet up and wrap yourself in cotton wool. That's based on social and cultural norms from the past and not necessarily scientific research. I'm inspired by gutsy women like Alysia Montano, a USA national track and field athlete who defied strong held views and ran 800m when five months pregnant. Or Serena Williams, who won the Australian Open earlier this year when she was pregnant. As my pregnancy progresses my approach to running has changed. I've become picky about what races I enter. They need to be well run, have plenty of hydration stations and are staffed by medical volunteers - just in case. I've also changed my approach to running. I listen to my body more, ensure that I rest between runs, use recovery techniques like sports massage and magnesium baths, and I've reduced my mileage and pace to keep my heart rate and body temperature within safe limits. I'm loving running with my growing baby and baby bump. What was previously a time for me to defrag my day has now become a time for me to connect on a deep level with my baby. I use this time to think about the life I hope to give my soon-to-be child and how i will continue to be a healthy and balanced role model for my child and community. And as hit the home stretch of my pregnancy and click over to 28 weeks this Sunday, I'm planning to celebrate with an 8km trail run that I know my baby and me will love! Did you enjoy reading Laura's story? You can connect with her on Instagram.